As I was combing the Tallahassee MLS preparing for another Waverly Hills home sales report, I was pleasantly surprised to see that the last distressed home sale occurred there more than one year ago. As we can see from the graph at the right, the distressed home sales trend (one year average) has been reduced to zero. Considering the rest of the market is averaging more than 1 in 3 home sales as a short sale, foreclosure or banked owned property, Waverly Hills home sales appear to be much stronger. The first that I notice when looking at the Waverly Hills Home Sales Graph below is that there are far fewer home sales in this Tallahassee neighborhood than we have reported in some of the larger ones. Fewer sales (less data) means that we'll see our results bounce around a bit, and we that very clear in the real estate graph below. Currently, there are 8 homes for sale in Waverly Hills. 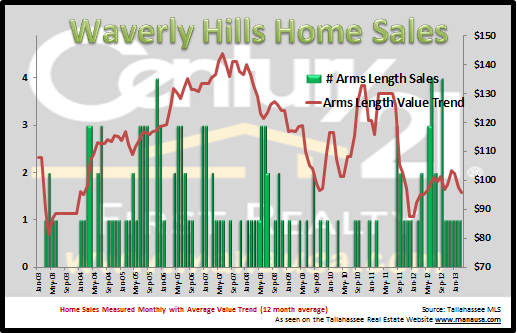 Currently, arms length Waverly Hills home sales appear to be bringing better values than year ago, but we have to keep a watchful eye for any new distressed properties hitting the market which could have an immediate impact. I hope you enjoyed this Waverly Hills Home Sales Report, please drop me a note if you want to know how changes in the market will impact your coming move in the Tallahassee real estate market.